I recall that Konnyaku jellies was very popular in the late 1990s as most Moms were always busy making those jellies for their kids then. Of course, my big kids loved the chewy fruity jellies too when they were very young. Well ... when they no longer ask or crave for these jellies ... 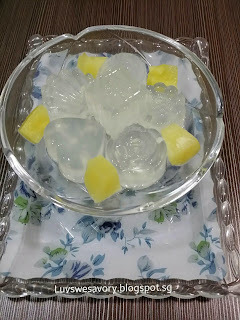 I no longer make these 'long forgotten' Konnyaku jellies at home ... hee .. hee. Made these jellies using coconut juice that contained coconut pulps. 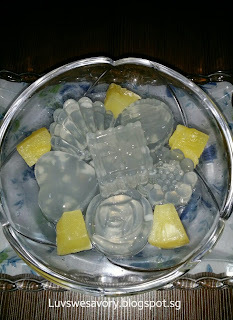 These chilled jellies definitely tasted refreshingly good in the current humid and hazy weather ! 1. Mix the Konnyaku powder and caster sugar together well. 2. Pour the mixture into a cooking pot of water (I replaced it with coconut juice) gradually over low-medium flame. Stir till boil, turn off the flame. 3. Keep stirring for about 5 minutes till the bubbles disappeared. 4. Pour into mould, chill to set in fridge about 3 hrs before serving. 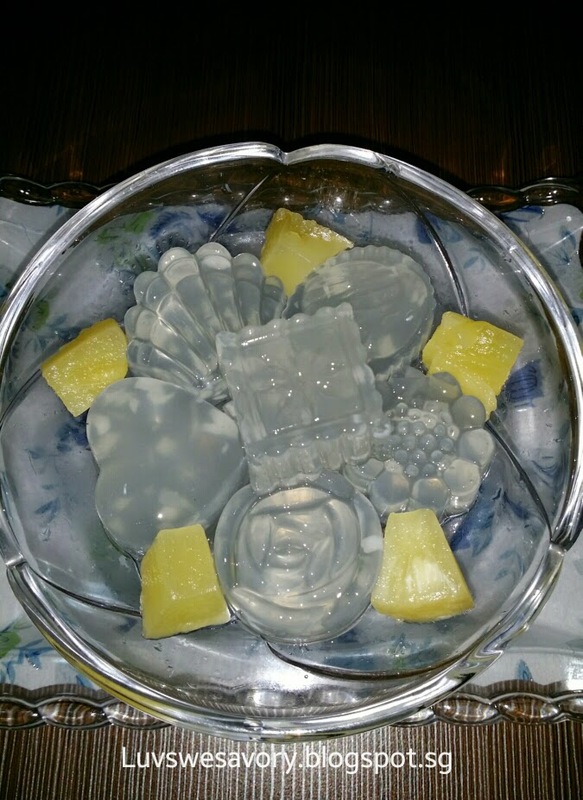 *served with some canned pineapple cubes, longan or fruits if you like. Karen, thank you for refreshing my memories of this jelly. Its been a long time since I last tasted this. Hmmm I think I will also make some to take my mind off this haze. 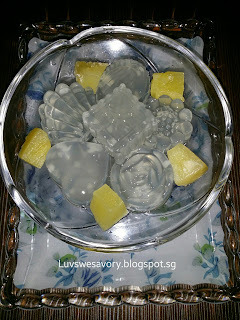 Hee .. hee ... those were the days ... do make some to enjoy these fruity chewy jellies! 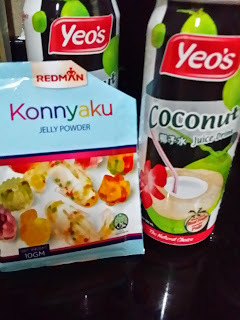 I love konnyaku jellies, what's more is coconut favor, yum! These are so refreshing good! Hi Karen, these jellies are very refreshing too for hazy days. Hi Kimmy, yes need to have fruits and fruity jellies ^-^! 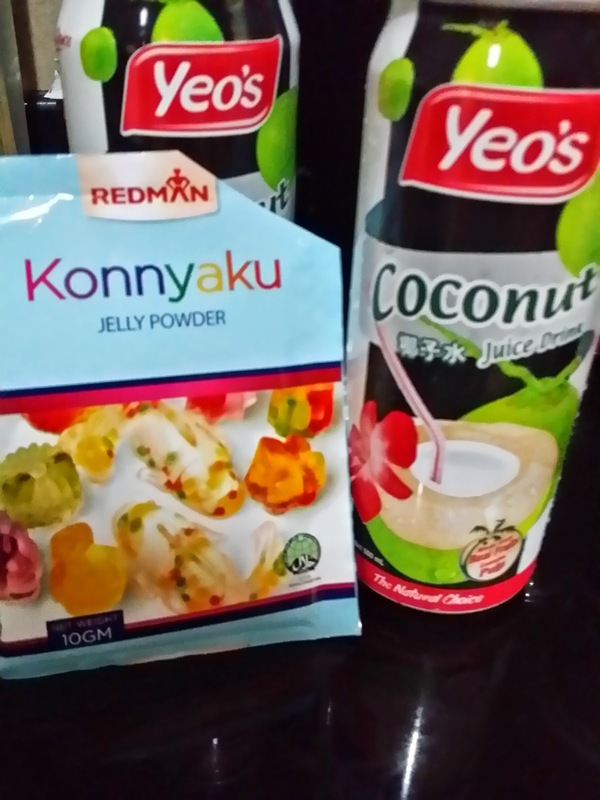 Will be joining you to make more Konnyaku jellies soon ^-^! Karen, I remember how popular konnyaku jellies were. So you have brought it back in fashion with this coconut one! Hee .. hee ...thanks Phong Hong.